In September 2009, I wrote about the fact that, as marketers, we are all competing in Times Square today. Simply put, people are overwhelmed with commercial messages. This came to light on my trip to Chicago yesterday. The picture you see here is of the handrail for the escalator. 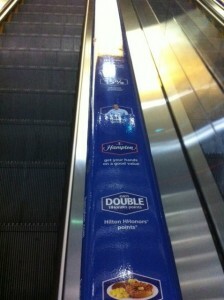 That's right, they've turned the handrail into an ad. I don't know about you, but I'm no more likely to go to this hotel than I was before. The moral of the story is that merely broadcasting is a useless strategy at best. More likely than not, it contributes to becoming increasingly irrelevant. Going forward, the only viable marketing strategy is to engage with your market.